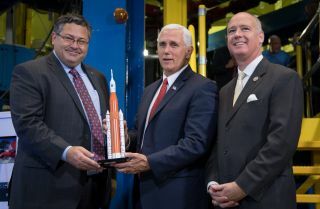 Vice President Mike Pence (center) receives a model of NASA's Space Launch System (SLS) megarocket from NASA Marshall Space Flight Center Director Todd May (left) as Rep. Rep. Robert Aderholt, R-Ala. looks on outside the SLS structural test stand, Monday, Sept. 25, 2017 at the center in Huntsville, Alabama. U.S. Vice President Mike Pence will convene his first meeting of the reinstated National Space Council on Oct. 5, White House officials announced Tuesday (Sept. 27). The meeting, titled "Leading the Next Frontier: An Event with the National Space Council," will be held at the Smithsonian National Air and Space Museum's Steven F. Udvar-Hazy Center in Chantilly, Virginia (where the space shuttle Discovery is on display) and will include testimony by space industry experts from civilian, commercial and national security fields. Trump resurrected the National Space Council with an executive order on June 30 in order to steer the future of American space policy. The council was last active in the early 1990s, during the administration of President George H.W. Bush. Pence chairs the reinstated council, with aerospace industry veteran Scott Pace serving as executive secretary. Gen. Paul J. Selva, vice chairman of the Joint Chiefs of Staff. Earlier this month, the Trump administration nominated Rep. Jim Bridenstine (R-Okla.) to serve as NASA Administrator. He must be confirmed by the Senate before taking charge of the U.S. space agency.